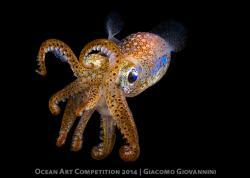 Stories behind the shot, including viral underwater photos and videos, impressive contest winners and more. The Nikon D850 and the Nikon D500 are two fo the most capable cameras on market currently for use in underwater photography. Let's take a look at the results when both of them are used on a recent dive trip - The D850 for wide-angle, and the D500 for macro. The 46 megapixel full-frame sensor on the D850 and its excellent auto-focus capabilities makes it ideal for wide-angle photography. The 16-35mm lens is a fast focusing lens, sharp behind a dome port, and able to zoom in for skittish subjects like bull sharks, hammerhead sharks, or mobula and manta rays. The D500, on the other hand, is ideal for macro and supermacro with its cropped sensor, and it retains many of the advantages of the D850. Using both the D850 and the D500 on a trip means not having to change ports & lenses, and being able to quickly swap setups if necessary. 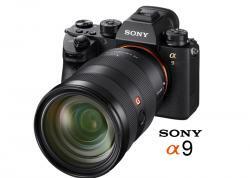 Both the 16-35mm and 105mm lenses used are AF-S lenses, which means they have an internal auto-focus motor. That is important, because AF-S lenses focus faster than lenses whose auto-focus is driven by the camera body, and it important when trying to capture behaviour shots. Straight out of the camera photos from the D850 look noticeably better than either the D500 or the D810, possibly due to its brighter pixels and better low-light capabilities. Autofocus in the 3D tracking mode was used with the D850 for wide-angle, and spot focus in continous focus mode was used with the D500. For settings, see the captions below each photo. Our Explore Baja, Sea of Cortez trip in early October 2018 on the Rocio Del Mar was to take us from San Jose del Cabo in the south all the way to Puerto Peñasco in the north – a distance of around 600 nautical miles over 12 days. The biodiversity of the Sea of Cortez is world renowned and we were all excited to get underway and begin our journey of underwater exploration. 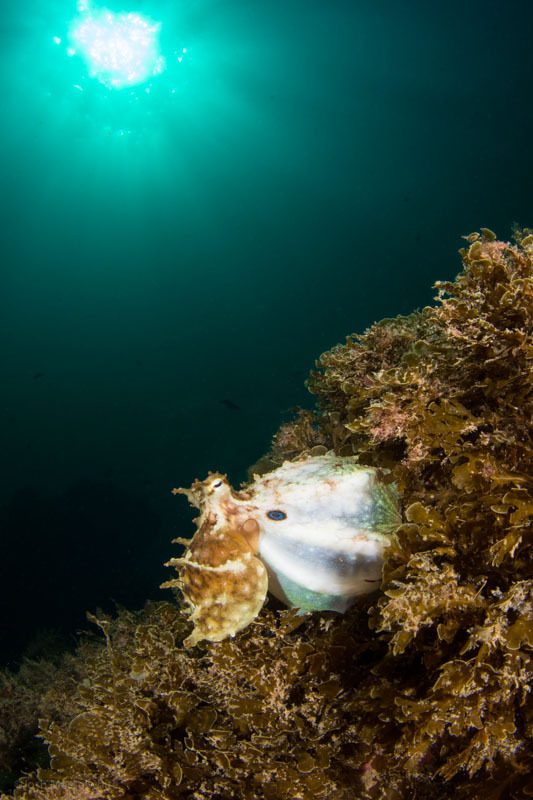 Exactly what you will see in this diverse bit of ocean is always unpredictable, but you can always rely on some amazing encounters with creatures both large and small. This was perhaps a less predictable trip than usual, with a hurricane forecast to move across the Baja peninsula in the middle of our cruise. A little juggling of the usual itinerary became necessary, but we were confident in the crew’s assurances that we’d still get in plenty of dives and see an incredible array of marine life. Onboard ship, the days start early, with a pre-breakfast dive as soon as the sun pokes its head over the horizon, before any day boats have even left port. We encountered very few other divers the whole time we were there – one of the benefits of exploring in such a sparsely populated region. 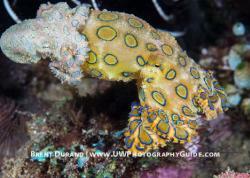 Our second day of diving ended with a spectacular night dive. We watched hundreds of mobula rays feeding on the plankton attracted to bright lights positioned by the crew in nearby shallow waters. Again and again they swooped down over our heads in formation, then up into the lights only to circle back around, fan out across the sand and swerve in unison for another fly by. Hundreds of Mobula Rays feeding during the night dive, taken with strobes. The water was stirred up full of plankton, so the only shots that came out good were when the mobulas were up higher. 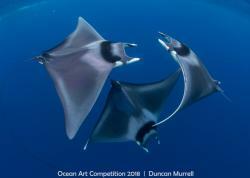 Often the last dive of the day was at dusk, a time of increased activity on the reef when the hunting and mating action intensifies as the last yellow rays slant through the water. We would surface to the deep orange glow of sunset and the swirling spirals of thousands of sea birds coming home to roost, mimicking the movement of the schooling fish below. The food on board was great – plentiful and always beautifully presented, with lots of Mexican flavors and wonderful desserts every evening. A couple of very pleasant evenings were spent dining in the open air on the top deck with a fabulous barbecue buffet accompanied by plentiful margaritas. One day, a huge pod of dolphins surrounded the boat and the captain turned full circle and slowed to their pace so they would play longer with us. “Hurricane protocol” necessitated a day holed up in the Bay of La Paz, but with 12 days of diving we did not feel too cheated by Mother Nature and were happy to be avoiding the brunt of the storm. 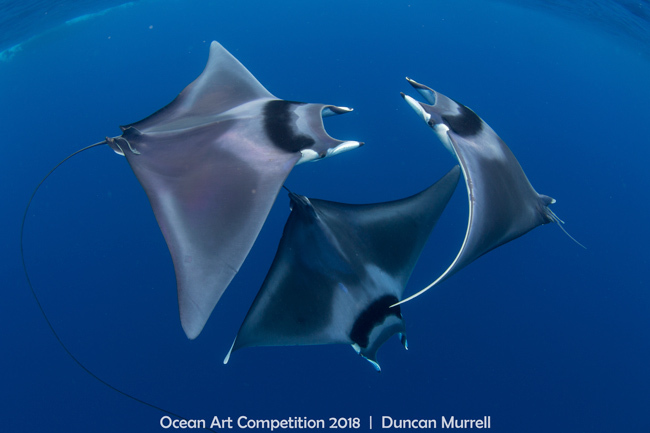 Our luck with rays continued at La Reina – we were privileged to witness the return of the giant Pacific mantas to the Sea of Cortez. Ducking from some ripping currents, we were awestruck by their effortless grace and calm, easy movement. Our photographs and video clips will be used to help researchers monitor and learn more about the behavior patterns of these gentle giants and hopefully lead to some protections for the species. Conditions at El Bajo were spectacular – a little too calm for the hammerheads’ taste, but we were treated to a beautiful view of the whole dive site with barely any current and watched intently as turtles came in for their cleaning rituals. 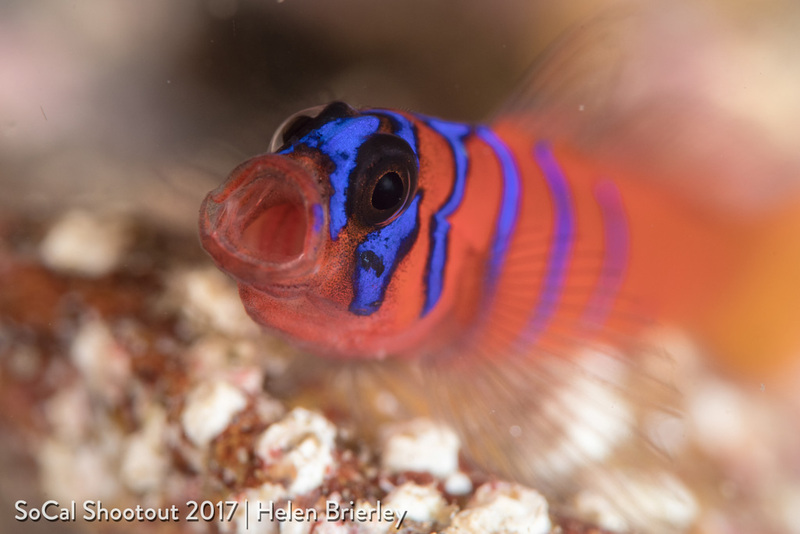 At several sites we had a lot of fun lying in wait for the signal blennies to perform, the pike blennies to show some aggression and the jawfish to rise up briefly into the water column. All the dive sites provided opportunities for both macro and wide angle images and every day we had a presentation and image reviews to hone our skills and better capture the amazing creatures and scenes we were witnessing. Signal Blenny raising his fins to "signal". No trip report from the Sea of Cortez would be complete without mention of the playful sea lions encountered at several of the dive sites we visited. 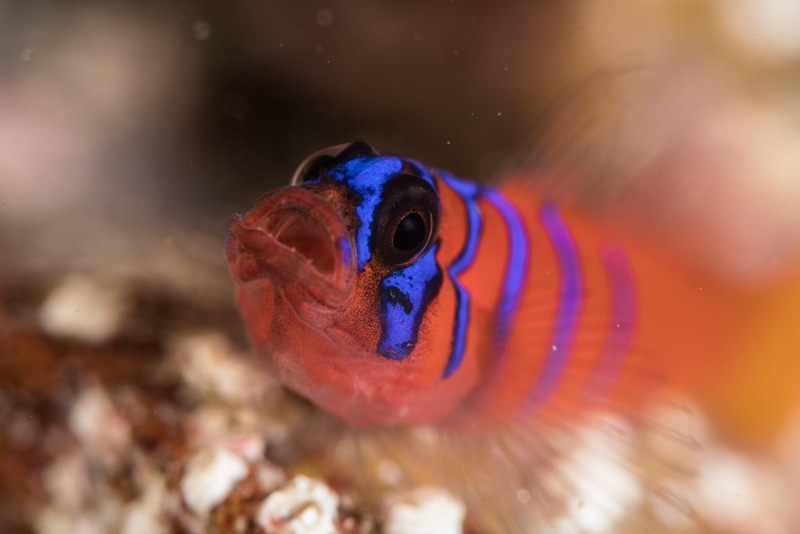 When I found myself lying on the sand waiting for a giant jawfish to emerge from its hole, getting dive bombed by frisky sea lions with a school of barracuda swirling overhead, I could not help thinking this is as good as it gets! Frisky Sea lions goofing around. From the very beginning of our adventure, to the time we all left the boat, the crew went out of their way to help in any way they could and to ensure that a fantastic time was had by every guest. All in all, it was a great trip with a really fun group from across the US and Europe, and some lasting friendships were made. Crown of Thorns, taken with a low sun right before sunset. Strobes were in close. Hydroid close-up. 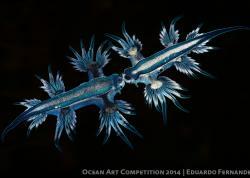 I had to point my strobes inward to get a black background, otherwise my strobes lit up the ground behind the hydroid. We are running an "Expore Baja" trip again, join us for Explore Baja 2019, or Explore Baja 2020! 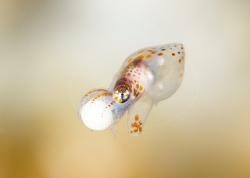 Helen is an award winning underwater photographer and avid sailor. She is also the chair of the ReefCheck.org board of directors. She resides in sunny Pacific Palisades, California. 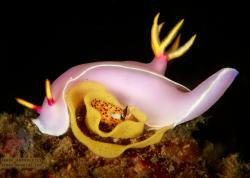 For me, diving and photography started roughly around the same time. After getting certified in California in early 2014, I was in such awe of the beauty underwater that I had to share it with my family. So, I purchased my first compact camera and began taking photos. I read every article I could get my hands on – especially those by the Underwater Photography Guide, and The Underwater Photographer, by Martin Edge, more times than I can count. After several years with my compact camera, I upgraded to a Nikon D7200 and dual Sea & Sea YS-D1 strobes, which is what I shoot now. The octopus encounter which led to my winning shot in the SoCal Shootout 2018 was unlike anything I’ve ever experienced before. I went out on Saturday with the Sundiver Express to the front side of Catalina. About 15-20 minutes into my first dive (at Little Gieger), I spotted him. At first, the octopus was very shy and tucked himself back into the rocks, so I ignored him and tried to shoot a nearby sea fan instead. But after about 3 shots, he started walking along the pinnacle. At that point, he didn’t seem to care about me at all; he had food on his mind. For the next 30 minutes, I watched him hunt. Every couple of steps, he would dig his tentacles into the reef and inflate like a balloon – turning solid white as he searched for food. To create an interesting background for the shot, I moved to the opposite side of the octopus and placed the sun at his back. Because he was moving around so much, I had to keep re-adjusting the settings for each shot to get the water color and sunburst I wanted. In general, I shot between f18-f22 and 1/200 to 1/320 on ISO 200. The strobes were at the 10-2 positions, 2-clicks below full power. To keep backscatter to a minimum, I angled the strobes straight down at the reef so that the front edge of the light would hit the octopus and not the water. 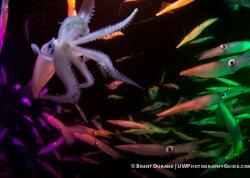 The octopus’s hunt was an amazing sight to witness and I feel very grateful and blessed to have been there for it. Josh Musselwhite is an Android software engineer who has been delivering app-for-that solutions for a decade and an enthusiast photographer. When not working, you’ll either find him scuba diving or at a jazz club listening and bobbing along. 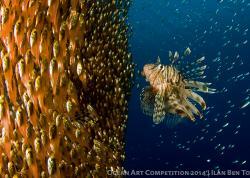 Story behind Helen Brierley's uncropped underwater photo that won "Best of Show"
I was diving in the Catalina Dive Park for the SoCal Shootout. 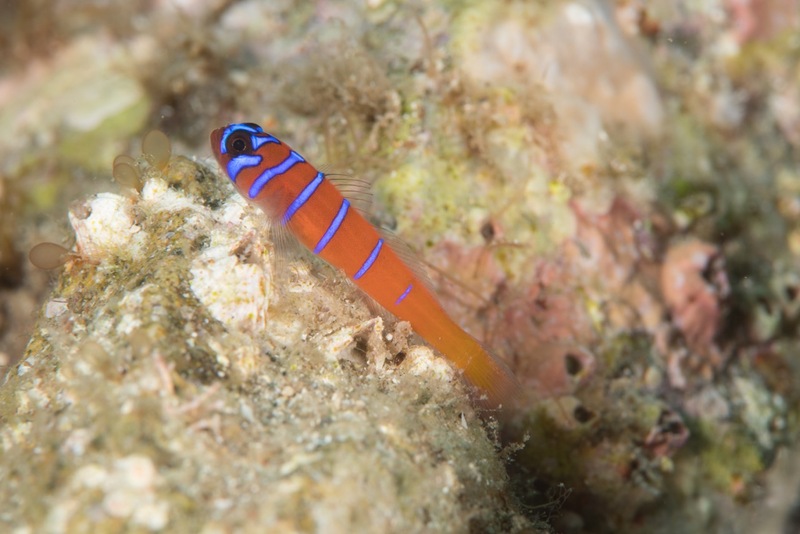 There were hundreds of blue-banded gobies, and most don’t want you to get close. I was lucky to find one that wasn’t shy, he held his ground and did not instantly flee like the others. I had already seen it dart out and eat something, so maybe it thought it had a good feeding spot. When it ate something, that motion had caught my eye and made me decide to come in for a closer look. 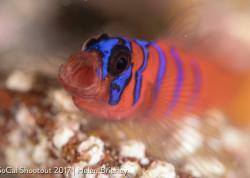 I took 35 shots of this particular goby. At one point it opened its mouth wide for a couple of seconds and I got 2 or 3 shots off before the mouth closed. My strobes were pointed slightly in. Photo was uncropped. I used the “creep in” approach, getting a little closer with every shot. I started without the diopter, and when I realized he wasn’t scared at all, I flipped the diopter down. His yawn lasted just long enough for me to get 3 very quick shots off. I used the Nikon D500 with the Nauticam D500 Housing, flash trigger, Nikon 105mm VR lens, two YS-D1 strobes and the Subsee +5 diopter. My settings were as follows - 1/200th, F18, ISO 200. That enabled me to have my flash reasonably low powered to recycle fast and F18 meant I could blur the background as I got in close, though it made the focus a bit more picky of course. Most of what I then altered as I moved in closer was the composition, focus and strobe position. [Publisher's Note] Helen's photo ended up winning best of show in the the 7th annual SoCal Shootout. Congrats Helen! Swallows Cave is located at the northwest tip of Kapa Island in Vava'u, in The Kingdom of Tonga. The cave mouth is about 15’ deep and about 20’ wide. We arrived on a dingy and as soon as we entered the cave I could see the shards of light dancing into the depths of the water and I couldn’t wait to jump in. We had no scuba gear so would be only snorkeling and freediving. My favourite work is created when using breath hold only - I find it less disruptive to the wildlife and I love the freedom of movement it provides. As we dived into the water, a cathedral of cascading light and shadow greeted us and visually played with the realms of reality. Your imagination can be free here and the thought of what was lurking in the darkness intrigued me. That familiar hand of the blue reaching up and willing you to dive down and explore, my camera in hand ready for some action. The cave was barren of life on the walls of rock which, was a contrast to the abundant coral reef that adorned the mouth of the cave entrance. 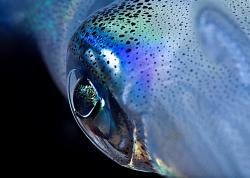 It was, however, brimming with bait fish that to look at was like observing a constantly moving sculpture reflecting flashes of light as the late afternoon sun hit their scales. Bait fish at depth are tricky to expose properly when using underwater strobes because of how reflective they are, but their movement was mesmerizing and when my freediver friend entered the water, diving right into the school, I knew there had to be a shot there. 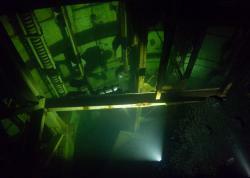 The Shot - a diver swims through Swallows Cave. Nikon D300, Tokina 10-17mm fisheye, Sea & Sea D300 housing, dual Ikelite DS125 strobes. Our first visit was during a busy time and a few boats had entered into the space. With snorkelers everywhere I knew that we would have to come back to shoot at a quieter time, and that the image I wanted to create would need a little setting up. Luckily Cath (who agreed to model for me) and another photographer were able to visit the cave at such a time and I had the opportunity to play with the strobe positioning in correlation to the sun entering the caves entrance and decided how best to direct the subject. With the unpredictability of the bait fishes movements we were required to make dives over a period of approximately forty minutes but we knew we had the shot. Sarah Alice Lee learnt to dive in the warm waters of the Red Sea at fourteen and has been in the water ever since. 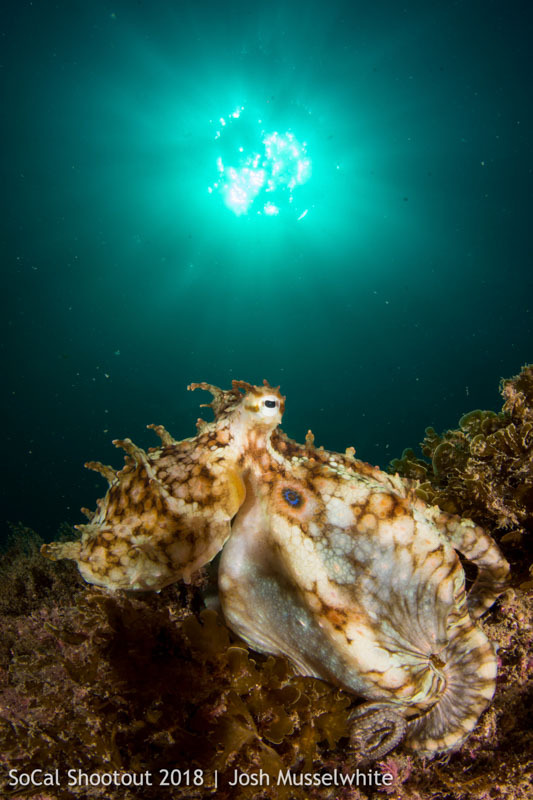 A qualified Padi instructor Sarah attended Falmouth University College Falmouth where she specilised in underwater photography for her BA HONS degree. She worked commercially in London upon graduating and then went to explore the world with her camera. Sarah chose Australia as her home followed by New Zealand and established her underwater photography business working both with wildlife under the waves and capturing images of babies underwater in pools all over Australasia. After ten years away Sarah returned to the UK in 2017 and can be found in pools all over the South East. 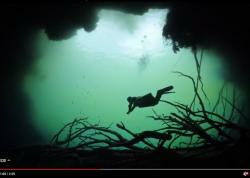 We recently caught up with wildlife videographer William Drumm about a web series he put together with fellow lensman Andy Trace: The Yucatán Dive Trek. The diving tour took place across (you guessed it) Mexico's famed Riviera Maya; diving reefs and cenotes and snorkeling with some big exciting animals. The adventure was organized by sponsor Yucatán Dive Trek, who did an excellent job showing these two videographers the local diving opportunties. The video series takes us along for the ride, with beautiful underwater footage mixed with the usual topside culture, food, shenanigans and inside jokes that come so natural on dive trips. We watched all 5 episodes and now can't wait to get back to dive the Yucatan! UWPG: How did you plan this trip and web series idea? William Drumm: What’s great about Yucatán Dive Trek is they take all the hassle out of planning the trip. You basally tell them what kinds of diving you want to do (Cozumel, cenotes, bull sharks, sail fish, whale sharks, tech diving, crocodiles, giant tarpon, etc.) and they help you plan it all. The trip we went on was a bit of all the best stuff that was offered during the time of year we went, which was May 2016. WD: By far my favorite part of the trip was in Chinchorro, diving with huge American crocodiles. It was the best single ocean adventure I have ever been on. Banco Chinchorro is an offshore atoll reef lying off the southeast coast of Quintana Roo, Mexico, near Belize. 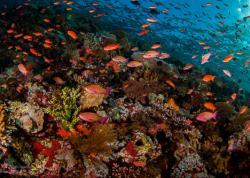 Around the diving is amazing diving, with most of the reefs still unchartered and never before dived. On the way out, you dive at some of these little seen reefs, and spearfish for invasive lion fish, used to lure in the crocodiles, and served as dinner for the guests once you arrive. While in Banco Chinchorro you stay in a small fisherman’s hut (shared between XTC dive center and a very friendly local fisherman). Almost right away, the crocodiles began to pop up around the fishing hut. The American Crocodile is a relatively large species, with males reaching a length of 5-6 meters, and females generally measure 3-3.5m in total length. Although the American Crocodile is similar in size to the salt water crocodile (Cocodrylus Porous) and the Nile Crocodile (Cocodrylus Niloticus), it is not as aggressive and does not include human beings as part of its diet, as the other two species do. Nevertheless, being in the water with these dinosaurs is definitely a rush! The entire experience, from the amazing coral reef diving around the atoll, to sleeping in the small fisherman’s hut, to interacting with the crocodiles themselves, was incredible. Were there any challenges to getting the right shots for the series? WD: The series was a run and gun operation. I found out that I was going a few days before the trip, and we showed up eager but not knowing what to expect. What followed was 15 day dash up and down the Yucatan, all over Quintana Roo, and ending up in a lagoon near XTC Dive Center with Mexico on one side and Brazil on the other. We had lots more adventures that didn’t make it into the series, including going to Cozumel for quick half day trip, and going to Calakmul Mayan ruins. There were absolutely challenges, mostly involved with the logistics of hitting so many spots in a relatively short amount of time. When you plan your trip, don’t rush things. 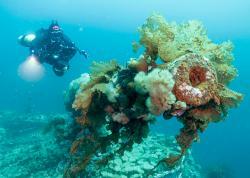 There is so much to see, but best to only hit a few of the amazing dive sites and activites on each trip. What camera gear were you using underwater? WD: I was using my Lumix GH4 and Nauticam GH4 housing, primarily with my 8mm Lumix fisheye. I also used the 12-50mm medium angle - macro zoom lens, and 60mm macro that I rented from Bluewater Photo. My lights were 2x Light & Motion SOLA 2500’s, and 2x I-Torch Venom 50’s, also from Bluewater Photo. I ended up shooting almost all wide angle, (crocodiles, cenotes, whale sharks), but loved the 12-50mm for its versatility. I also liked the I-Torch Venom 50’s. They were nice and bright, however they seemed a bit cooler temperature than I am used to and I had an unattractive oval where the two lights met, at least while diving cenotes. Andy Trace, who filmed all the shots of me and some of the wildlife and other dive footage, was using his Sony A7RII, with a cheap ($260) Meikon plastic housing. For the price, we were both surprised that the Meikon worked as well as it did, although it probably works fine until it doesn’t and it floods. View more of William Drumm's work at WilliamDrumm.com and follow him on YouTube, Facebook, Instagram, and Twitter. Teahupoo is know for its surf break - a glassy and heavy wave with a lip that detonates across a shallow reef. Some of the best surfers in the world travel to Teahupoo (located on Tahiti in French Polynesia) to prove their big wave skills in the clear water, and naturally, surf photographers follow them there. Shooting photos of surfers from the water at Teahupoo can be a challenge, as you want to be close to the action while remaining safe in ever-changing conditions, since finding yourself in the wrong place at the wrong time can have serious repercussions. Photographers who also surf have the advantage, as it allows them to swim into the best spot to shoot, using long-time experience with waves to capture perspectives that look great from the water. Shooting surfers and waves underwater goes beyond this. We are very lucky to have some crystal clear water in Tahiti, and I took advantage of this many times to create some amazing images of surfers at Teahupoo... shot from below. 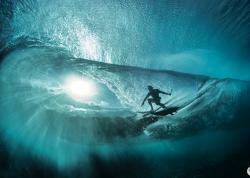 For this shot of Anthony Walsh at Teahupoo I used a Canon EOS 1DX with a 8-15mm fisheye lens inside an Aquatech 1D Delphin Housing with a medium fish eye dome. Aquatech housings are the best for surf and wave photography as they are light, functional and allow you to move fast compared to dive housings. They also have a trigger grip that allows you to shoot with one arm extended. 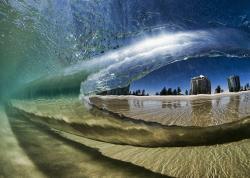 Be sure to check out the rest of our surf and wave photography tutorials. Take an inside look at the underwater camera gear used by UWPG editor Brent Durand to lead two upcoming photo workshops in Sri Lanka. Our latest installment of What's in the Camera Bag looks at the gear used by UWPG editor Brent Durand. I've been fortunate to shoot with quite a few different camera systems over the past few years. And after using various compacts, mirrorless and even DSLR cameras, plus leading a workshop last fall with just a GoPro, it has become apparent that the small, inexpensive systems can hold their own against more exensive setups in some situations. Why? Because those of us who aren't working pros shoot to share online - an arena where action cam images and video can collect just as many likes and can go just as viral, or even more viral, than imagery from mid and pro-level camera systems. The simplicity of use in small cameras allows us to be more aware in the water and to engage more consciously with marine life. 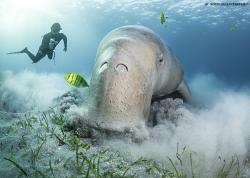 Small cameras allow us to pay more attention to dive buddies. 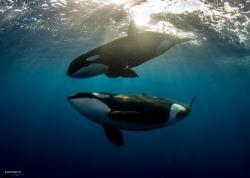 They're more streamlined and easy to swim with. They cost far less and are easy to pack. They make prep and cleanup for local diving easy. Their affordability allows more of us to share our experiences underwater with divers all over the world. In short, small cameras are proving their place in the big camera world. And without further ado, here's a look at my camera bag for leading Bluewater Photo's back-to-back Sri Lanka photo workshops. 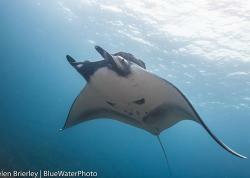 Redundancy is very important on a dive trip and I always make sure to roll with two cameras. 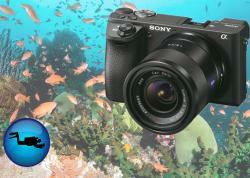 For Sri Lanka underwater photography and video, this will be my mobile phone and a GoPro. I plan to pop my mobile phone into the Kraken Sports smart phone housing, pump the vacuum and be ready to go. The 67mm ring adapter allows use of any 67mm wet lens (optics tests still to come). This housing retails for just $299 USD! GoPro's image quality is incredible for a $400 camera. If you don't believe me, just check out the still images in our GoPro HERO5 Review for Underwater. I plan to shoot the HERO5 a bit more during our second workshop snorkeling with whales and dolphins. The Kraken Sports smart phone housing paired up with dual Kraken Hydra 5000 video lights, useful for both underwater video and constant lighting still images. The rest of my camera kit pairs everything down to the essentials: Dual Kraken Hydra 5000 video/constant lights, Ultralight Control Systems tray/arms/clamps, homemade selfie stick (yes, tease away), the new Fantasea / AOI UCL-09 macro diopter, and the new Fantasea UWL-09F wide-angle wet lens. This lightweight kit will deliver Full HD video and amazing images at a fraction of the cost of a camera/housing system and is much easier to travel with. I always pack a mini tool kit for international dive travel (the box on the left in the shots below), which can help fix most basic housing problems in the field. 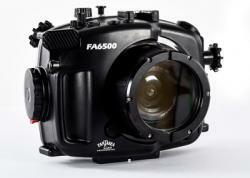 The box is super light while the tools are the lightest versions of things found useful during underwater photo trips. Not pictured is the usual trip stuff like duct tape, aquaseal, superglue, microfiber cloths, topside camera rain cover, mini first aid kit, etc. It's essential to be able to make basic gear repairs in the field, especially on dive trips where there likely aren't any other underwater photographers around. Our latest installment of What's in the Camera Bag looks at the gear used by photo pro Serge Abourjeily. I switched to Nauticam housings in 2010 because of their spot-on ergonomics. The best example is how the cursor for changing focus points is located right on your fingertips, which is essential to me when shooting macro. Not having to take your eyes off the viewfinder to change settings is priceless, and I would not, at least at the moment, want to switch to another housing brand. Another important important aspect of my camera system – besides housing ergonomics – is trim. I use 6 different float arms and some "normal" arms to achieve the desired buoyancy for each lens/port combination. I also use a carbon arm with quick disconnect for my INON LF-800N torch; I can take it off with one click and use it for lighting or backlighting. I am currently using Sea&Sea YS-250 strobes and love them for their power, recycle time and reliability. I have used various INON and Sea&Sea models before but really appreciate the speed of battery packs over strobes that take AA batteries. I optically trigger them, which allows me to use rear curtain sync on Canon. It's a shame that Sea&Sea has discontinued these beautiful strobes. I'm now considering a switch to Seacam strobes.